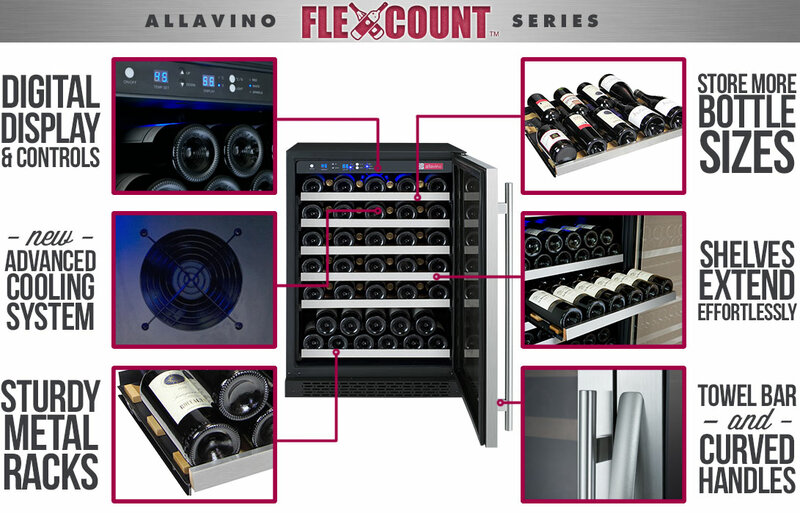 The all-new FlexCount Series VSWR56-1SSRN Single Zone Wine Cooler Refrigerator from Allavino offers elegant built-in or freestanding storage of up to 56 bottles, and is loaded with special features that make enjoying your favorite wines easier than ever! Its cutting edge shelves are constructed of durable metal, providing reliable stability and preventing sagging over time. These shelves are thin enough to allow more space between shelves than you will find in similarly sized wine refrigerators, allowing you to store larger bottles without sacrificing bottle capacity. 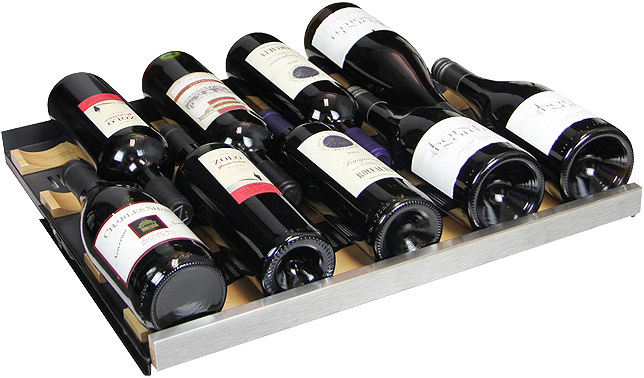 Each shelf has an attractive stainless steel front to match the door, and features wood slats that cradle your bottles and help minimize vibration. 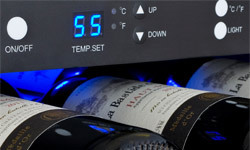 Digital display and controls allow you to easily adjust the temperature, which can be set low enough for sparkling wine, or high enough for red wine. The built-in, undercounter design allows you to install this refrigerator in cabinetry for a seamless look, while finished sides and top give you the option to use it as a freestanding unit. This is the standard 750 mL bottle, which most wine refrigerators are configured around as it is the most popular size on the market. It measures 11-1/2" tall with a 2-15/16" diameter and the shoulder tapers up from 7-3/4" to 8-1/2". 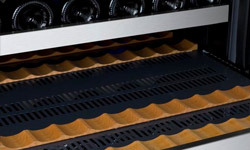 This wine refrigerator can easily store 9 of these bottles on each of the upper shelves and 11 more on the bottom shelf for a total of 56 bottles. This bottle is taller than the standard 750 mL bottle. It measures 12-1/16" tall with a 2-15/16" diameter and the shoulder tapers up from 8" to 9". The taller shoulder and top would normally wreak havoc on your wine storage because the necks would touch, making the overall length of the bottles too tall for most shelves or pushing the outside bottles out, causing them to hit the sides of the wine refrigerator. Generally, you would have to remove a shelf to accommodate these bottles, but with the extra space available on these shelves, they fit just fine and do not affect the overall capacity. This bottle has the same diameter at the base, but the shoulder is wider, which would generally push it out of the grooves and make it rub on the shelf above. It measures 11-7/8" tall with a 2-15/16" diameter at the base and the shoulder tapers up from 7-1/2" to 8-1/4" with a 3-1/16" diameter. Due to the smart spacing on these shelves, these bottles fit with room to spare, preventing rubbing and allowing the maximum bottle capacity to stay the same. This bottle is wider and shorter than the standard 750 mL bottle. It measures 10-5/8" tall with a 3-1/4" diameter and the shoulder tapers up from 5-1/2" to 8". Bottles this wide don't usually fit in wine refrigerators and if they do, they have issues with rubbing on the shelf above and scuffing your labels. 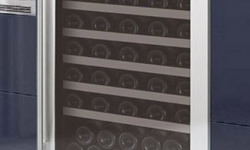 This wine refrigerator has no issues with this type of bottle so once again, your maximum capacity will not be affected if you have them in your collection. Until now, you wouldn't dream of fitting a Pinot bottle in an undercounter built-in wine refrigerator without drastically reducing the overall capacity. It measures 11-5/8" tall with a whopping 3-1/2" diameter and the shoulder tapers up from 5-1/2" to 8-1/4". On this model, only the bottom shelf is slightly affected. You can fit 6 bottles comfortably in the grooves by alternating the necks. So even if your ENTIRE COLLECTION was made up of Pinot bottles, your total capacity would only be reduced to 51 bottles! Champagne bottles are too big to fit on the upper shelves, but you can still store up to 6 on the bottom shelf. They measures 12-1/4" tall with a 3-3/4" diameter and the shoulder tapers up from 5-1/2" to 7-3/4". Most wine refrigerators this size would not be able to store any Champagne bottles without removing a shelf. Comments: This is a very nice looking wine refrigerator. It\'s working very well so far. Everything went well from ordering, to delivery. The only thing I would change is being able to see the digital temperature on the front. We are happy with it so far!!! Comments: Unit is well made and the shelving appears to be user friendly with full pull-out shelves and good bottle conforming racks. Bought a single zone system to minimize operational issues keeping two zones at different temps. This should minimize temp fluctuations which seems to be a problem with dual zone equipment. Having a choice of two handle styles is a bonus and the packaging was exceptional, with thick Styrofoam and cardboard to protect the shipment. Looking forward to getting some good wine into the unit. Comments: I have had this refrigerator for a few weeks now. I really like the shelf design and the quality of the drawer slides. 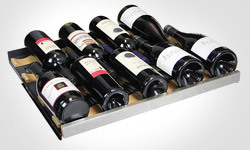 The drawers feel sturdy even when fully extended and storing wine. 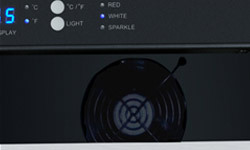 The unit is also quieter than a standard refrigerator when running with no noticeable vibration. 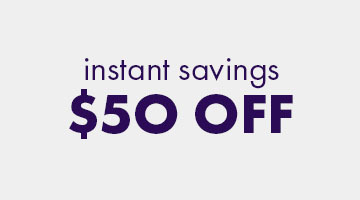 Comments: I upgraded from a basic Frigidaire 50-bottle model from a warehouse store, and although this was a bit more in price, I'm VERY happy with the result. I wanted something low-profile that holds about 100 bottles, with a refined look, that fits multiple size bottles, and that allows me to browse easily through my selection (via smooth roll-out shelves). My old model was crammed, bottles scraped in/out, and the shelves didn't really slide, so it was a pain to stock it or browse through what I had. This new model is wonderful! I like that the side-by-side gives big capacity, but doesn't tower in my great room. I'm able to place things on top of this (cigar box, wine opener, decor) and it's not too ominously obtrusive in the room. I used the "towel-bar" door handles (it comes with two styles, and you can choose), and they look classy. Also, mine is black in color with wooden shelves -- it goes great with a Tuscan room theme and does not stand out too much. I can easily fit all types of bottles (tall riesling, wide pinot, regular bordeaux) on the shelves without trouble sliding in/out. For a few odd sizes (champagne), I use the big bottom shelves. 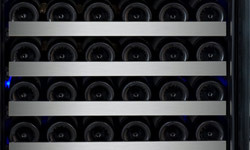 Most bottles stack 11/per shelf, but some rare ones require different spacing side-to-side. Overall, no complaints. The shelves slide in/out easily, and it's a pleasure to browse for a night's selection of wine. I set one side cooler at 55 (white & light reds) and the other side warmer at 60 (bold reds). The fan airflow keeps the shelves fairly uniform in temp. - The inner "airflow" fan is very quiet, but the "cooling" fan is a bit more noticeable. Not obnoxious, but it's noticeable in the room. Once stocked and the wine is cooled (after a few days), it does not seem to kick on very often. - I notice a smell when I open the doors. I think it's from the wooden shelf finish treatment, and I expect it will go away. It was very strong the first few days, but I put a box of baking soda and a charcoal odor absorber bag in the back of each fridge and it seems to be diminishing. Maybe I should have left it open and unplugged for a few days before use? This unit is a single zone unit. Based on your question, I believe that you have the VSWR56-2BWLN with two temperature zones. With the dual zone units, as stated under the "Features" tab "the lower zone must be set at least 4° and no more than 12° higher than the upper zone. It is normal for there to be a 3-5° variance between the top and bottom of a zone." Do i need to plug these into separate outlets? Yes, this is made up of two separate units placed side by side and both need to be plugged into separate outlets. How long is the power cord (single-zone model)? The cord measures at 77 inches. is it possible to get this unit in black with a beverage center shelving on one side instead of wine racks? This unit is only available with a stainless steel front door.